They may have written the most fundamental document for our nation, but some of the founding fathers weren’t that great with basic personal finance. We talked to the experts about what the founding fathers’ financial flubs and successes can teach you about minding your money. Jefferson’s famous financial flaw was his large debt load. Susan Kern, visiting associate professor at the College of William & Mary and the author of “The Jeffersons at Shadwell,” says Thomas Jefferson was the victim of a lavish lifestyle and a declining business. The third President of the United States was never one to pinch pennies, Kern says. “His financial records are this amazing trove of details and a tool for historians that give us a very exact notation of things — where he was buying, what he was buying — but one wonders if he ever stopped to total the bottom line,” she says. 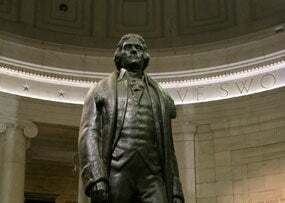 Jefferson would reportedly spend $800 a day (in today’s dollars) on groceries while he was in the White House, according to Ted Connolly, a bankruptcy lawyer for Looney & Grossman LLP who researched the founding fathers for a book he authored. A large portion of that was on wine. Not all of Jefferson’s debts were of his own doing, though. After his father-in-law passed away in 1774, Jefferson inherited all of his debt — and 135 slaves — in the midst of a volatile Virginia tobacco industry, Kern says. He was also a large proponent of taking responsibility for your debts. As a tobacco farmer, Jefferson was habitually using credit to make purchases since he would not find out how much money he had made on his exports until months after he shipped the goods. This was a common practice for farmers at the time, but one that caused major problems after the Revolutionary War. Connolly says Franklin’s humble beginnings contributed to his frugality. He was one of 17 children and he had to start his own businesses and build up his own wealth. Franklin died a wealthy man and his businesses were successful. The fifth President of the United States was, like Jefferson, not the most financially responsible architect of freedom. Monroe has sizable debt as he reached the end of his life due to the decline of his plantation. Like many tobacco farmers (Jefferson included), Monroe’s business suffered from the lower price tobacco brought. Connolly says that Monroe even experienced a deed-in-lieu of foreclosure over a $25,000 debt, which in today’s terms would be somewhere in the area of $750,000 to $1 million. Monroe also had to ask the federal government for what Connolly calls “a bailout” of sorts. Having racked up some debts while traveling on behalf of the government, Monroe requested that Congress reimburse him for the expenses to the tune of $30,000. Congress eventually granted him the money. Washington was known as one of America’s wealthiest presidents, and this is due in part to his land ownership. Connolly says both George and his wife, Martha, had large holdings of land, but the key to his wealth was his good sense for money. “His salary as President was 2% of the U.S. budget, which was pretty big at the time,” he says. For reference, Connolly says 2% of last year’s federal budget was $76 billion, though the budget is obviously much larger today.